All of the league match previews and betting predictions you will find on the Soccerwidow site are based around data obtained from our True Odds and Value Detector Spreadsheet, which is available to purchase with or without an Asian Handicap option. 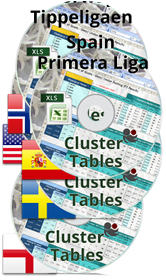 For this match we used a modified version of the spreadsheet for international club competition games with little or no head-to-head history. Gambling without emotion and with ‘value’ on your side is the only way to approach betting for profit. The Soccerwidow spreadsheet combines historical statistics with current betting odds to determine whether a bet carries value, and also shows the percentage likelihood of winning the bet. Soccerwidow watched in amazement last weekend as Borussia Dortmund dismantled Bayern 5-2 in the German Cup final, and to say the Bavarians had other more pressing engagements on their collective mind is an understatement. Their superstars just didn’t show up against Dortmund – were they were saving themselves for the Champions League, or has their bubble really burst? The pressure is really on the Germans in their own stadium if they wish to join the exclusive clique of clubs who have won the Champions League (or European Cup) on more than four occasions, and indeed they can become just the fourth team in history to do so. Chelsea of course are looking for a cup double and have found a ‘big game winning mentality’ at the right time of the season, something that perhaps Bayern lack right now. The Blues are looking to emulate Manchester United who are currently the only team to have won the FA Cup and Champions League in the same season (1998-1999). The fact that winning the tournament is Chelsea’s only route back into the competition next season means they are under considerable pressure and club owner, Roman Abramovich, has upped the stakes by offering his team a ‘win bonus’ pool of €12,300,000 (€429,000 per squad member) to bring home the trophy. The Germans have won all seven of their home matches in the Champions League this season, whilst Chelsea have won only once on the road, 0-1 in Portugal against Benfica. Both teams have won four out of their last five Champions League fixtures. As this is such a big game with so many people calculating, the odds do tend to match the statistically expected probabilities on most of the available bet types, meaning there is very little ‘value’ (mathematical ‘edge’) around. For example, there is no value in backing the draw on Saturday, currently priced at 4.0; it should be nearer 4.83; also, backing Chelsea over 90 minutes is over 30% under value at 4.7. Value Betting Tip 1: Laying Chelsea at 4.8 brings almost 45% value as we calculate their ‘true’ back odds to be around 6.94. Value Betting Tip 2: Backing Bayern at 1.83; brings a little value of around 18% based on their ‘zero’ or ‘true’ odds of 1.54. This bet carries a 64.9% probability of winning. Value Betting Tip 3: Backing Half-time: Under 1.5 Goals at 1.46 carries even less value (under 3%) but the probability of winning exceeds 70%. We understand that not all bets will win. Our strategy therefore revolves around the principle of ‘value’ betting (mathematical advantage based on statistical probability) – read the detailed review of our Betting Prediction Results: Dec 2011 – Jun 2012. Who’s Going to Win the 50th German Bundesliga Title?